In True Love Dates, Debra Fileta encourages women not to 'kiss dating goodbye' but instead to experience a season of dating as a way to find real love. Through reading powerful, real-life stories (including the author's personal journey) and gaining insights from Fileta's experience as a professional counselor, readers will discover that it is possible to find true love through dating. Christians are looking for answers to finding true love. They are disillusioned with the church that has provided little practical application in the area of love and relationships. They've been bombarded by Christian books that shun dating, idolize courting, fixate on spirituality, and in the end offer little real relationship help. 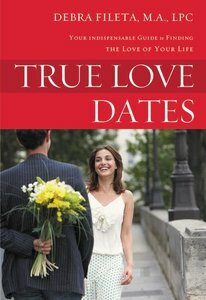 True Love Dates provides honest help for dating by guiding readers into vital relationship essentials for finding true love. Debra is a young, professional Christian counselor, and True Love Dates offer sound advice grounded in Christian spirituality. It delivers insight, direction, and counsel when it comes to entering the world of dating and learning to do it right the first time around. Drawing on the stories and struggles of hundreds of young men and women who have pursued finding true love, Fileta helps readers bypass unnecessary pain while focusing on the things that really matter in the world of dating. Customer Reviews For "True Love Dates"
I picked up this book for review after reading an interesting article by the author in Relevant magazine. I'm not a singleton looking for love. In fact, I'm about to celebrate my twentieth wedding anniversary. But my marital status doesn't matter. Although True Love Dates is aimed at singles, I though the advice was relevant for all ages, for anyone who is looking to improve their relationship with a date, fianc or spouse-or even their child. I had a vision for my life in my teens, but marriage and children have taken over. I know who I am, but do I know who I want to be when I no longer have children at home? And do I know who God wants me to be, now and in the future? I like the fact that Fileta is writing from the point of view of a Christian who lives in the real world. It was refreshing to see dating examined in a way that is relevant and relatable. Recommended.